below? A portion of Green Township, Summit County, Ohio is somewhere in the distance. NE, NW, SE, or SW) from the body of water to where the photo was taken. (i.e., or e.g., from Fort Wayne, Indiana)." 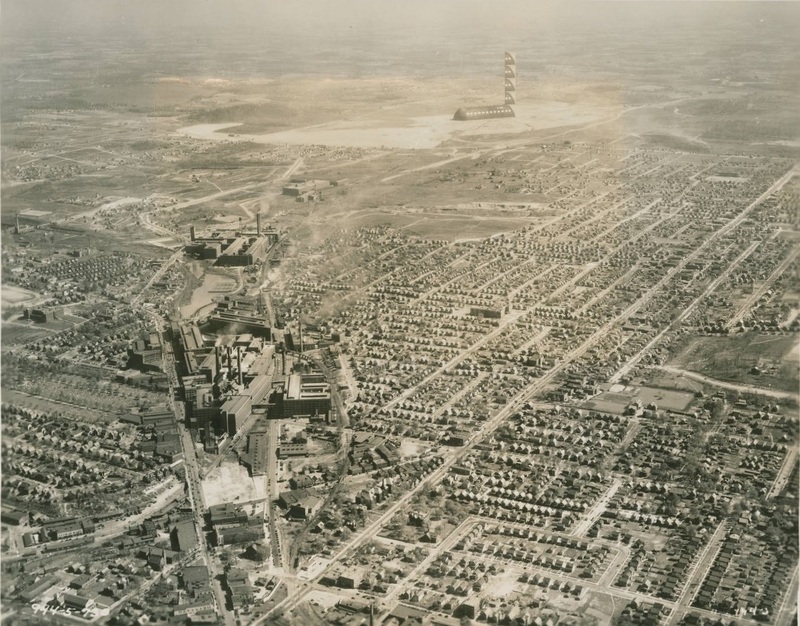 The old aerial photo was taken in 1937 or 1938.
photograph was taken NW (northwest) of the lake. and Zeppelin Hanger in the background." Latitude: N41�01'51.7", Longitude: W81�28'17.7", Elevation: 1,042 feet Mean Sea Level (MSL). 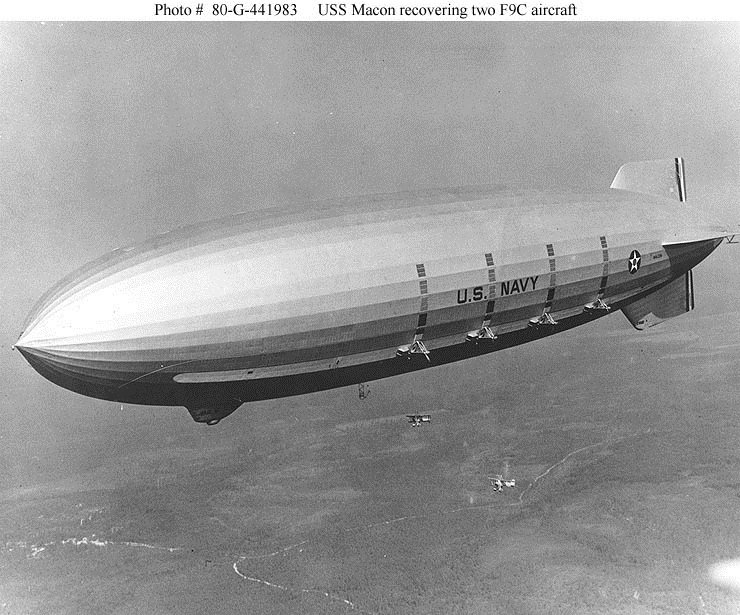 and its sister ship, the USS Macon (ZRS-5). The Airdock was constructed from April 20, 1929 to November 25, 1929 a cost of $2.2 million. 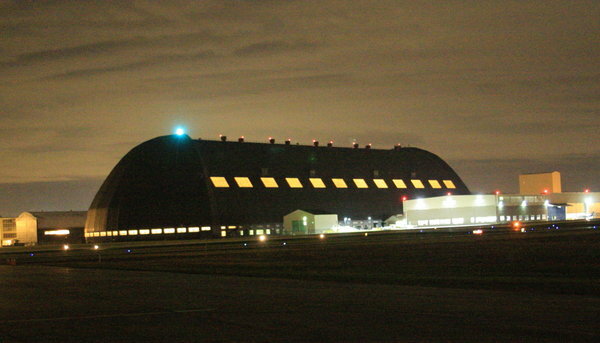 the Airdock was the largest building in the world without interior supports. The USS Akron (ZRS-4) was first launched on August 8, 1931.
after it crashed when sent out to rescue those on the USS Akron. 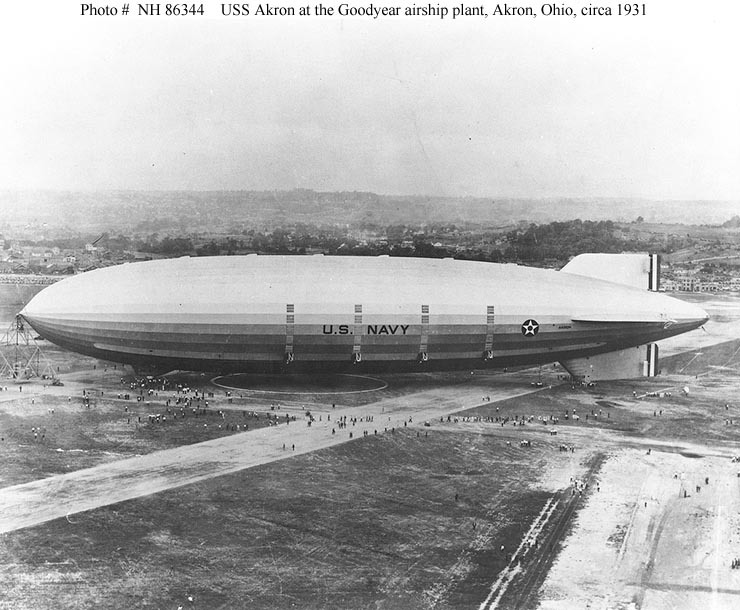 The USS Macon (ZRS-5) first launched on April 21, 1933, just a few weeks after the Akron crashed. performed at the time of the crash. Two of the 83 crew members lost their lives. Hindenburg, and were filled with helium instead of hydrogen as the Hindenburg. range that the Akron and Macon could scout the open ocean for enemy vessels. 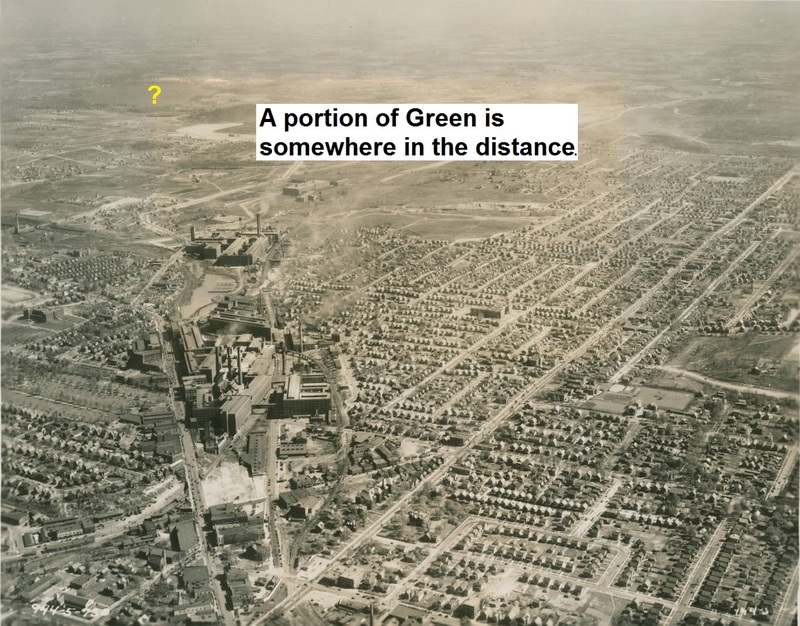 PROOF THAT "A portion of Green is somewhere in the distance." the horizon (i.e. to or beyond Green). The known elevation at the Airdock is 1,042 feet. We know that the maximum height of the Airdock is 211 feet. have put the horizon in the vertical center of the photo, when the old aerial photo was taken. location, past the bottom of the old aerial photo, and on to the Airdock southern top point location. to and beyond the Airdock. for our calculations to be valid. would be able to see the aircraft just above the southern top point of the Airdock. "A portion of Green is somewhere in the distance." 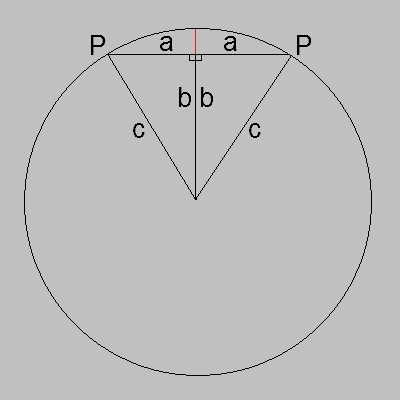 photo to be flat instead of a portion of a sphere (actually an ellipsoid that bulges at the equator). greater than the distance calculated, will be ignored. with a variance of about 150 feet to Green, elevation will be ignored. Refer to http://mygeoposition.com/ for elevations. The side Adjacent (A) to θ is the horizontal yellow line. The side Opposite (O) to θ is the vertical blue line. 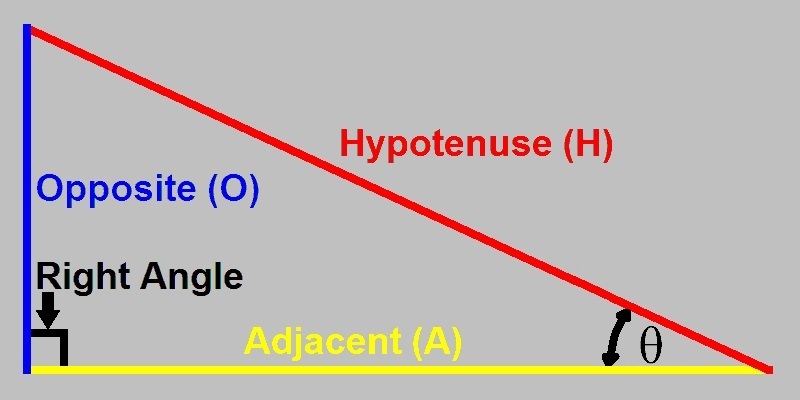 The Hypotenuse (H) is the side opposite to the 90 degree angle and is the red line. clarity, and because it provides understanding in preparation for the next section. through the surface of the Earth. minus the amount it rises between the two points as indicated by the red line. for a rise of 20,925,525 feet which is the radius of the planet as expected and is correct. 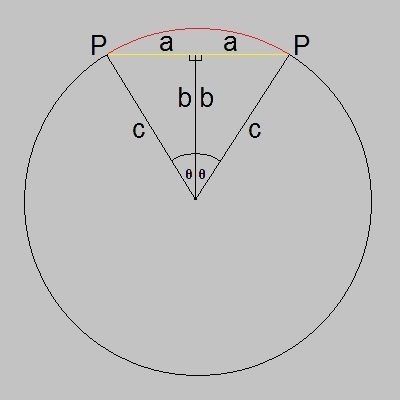 The Earth curvature arc distance between two points is different from the straight line distance. lot location when connected by the Earth curvature arc versus a straight line. has a value of about 3.1415926536. 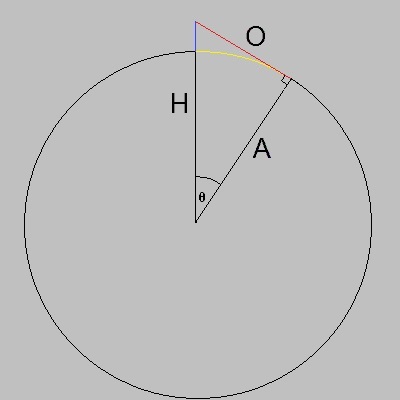 In the graphic above, a = O and c = H.
Note that θ is then multiplied by 2 for both right triangle angles. and twice that is indeed the circumference of the Earth in miles as in 24,901 miles. There are two distances to the horizon that can be considered for a specified altitude. distance from the altitude point directly (i.e. through the air) to the point on the horizon. indicated by the blue line. 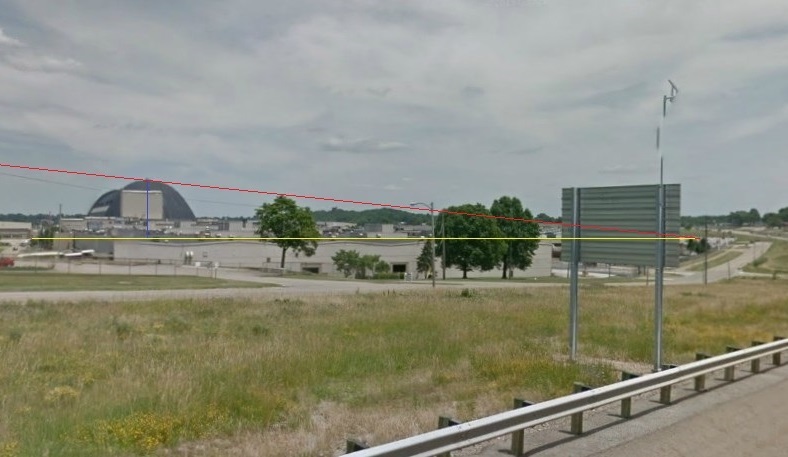 height of the Airdock and the latitude/longitude of those two points. shown by aerial photo above. 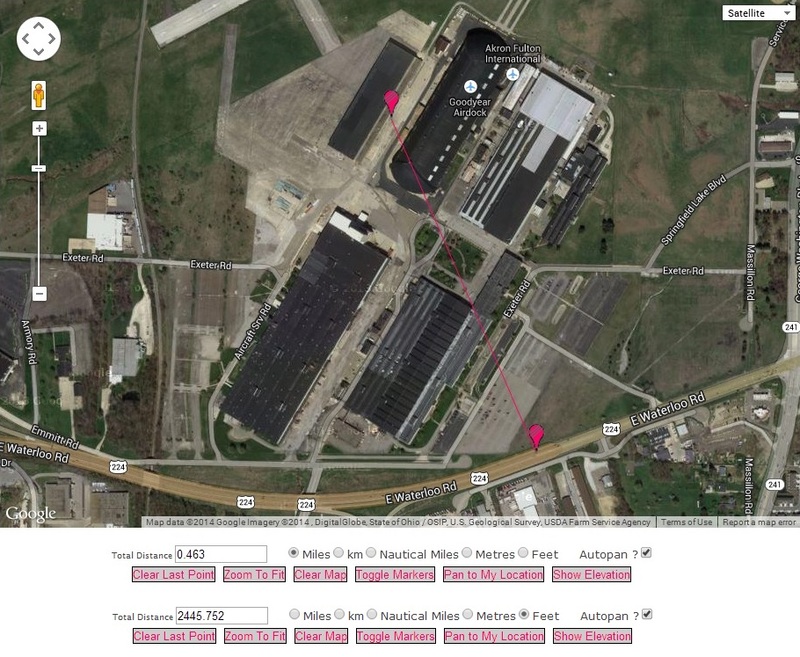 A = distance from point in parking lot N41�01'33.6" W81�28'08.7" and Airdock N41�01'51.7" W81�28'17.7"
which is only 2.6 percent difference. Rounding to 6 degrees makes the difference even less. CAUTION: Some Great Circle calculators give different results. lot is 4.144 miles or 21,880.32 feet. 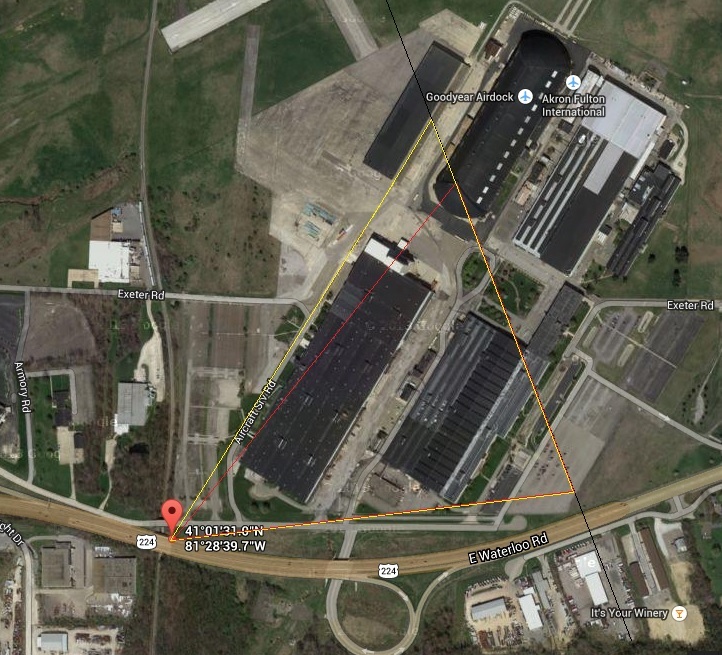 The aircraft is located at N41�04'53.6" W81�29'57.1". 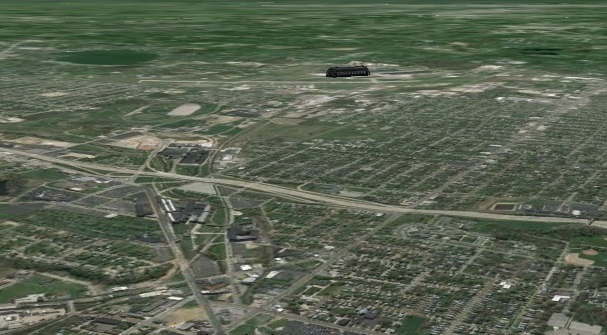 At the altitude of 2,300 feet, the horizon is 59 miles from the aircraft. N41�01'33.6" W81�28'08.7" is: 157.759� (distance = 4.144 miles). N41�01'58.0" W81�25'44.4" is: 132.639� (distance = 4.977 miles). N41�02'29.1" W81�29'28.4" is: 171.48� (distance = 2.801 miles). Northeast of Salt Fork Lake. "A portion of Green is somewhere in the distance". using the 211 feet high Airdock and it's location. which is 6.687 miles from the approximate latitude/longitude of the aircraft. which is 6.661 miles from the approximate latitude/longitude of the aircraft. 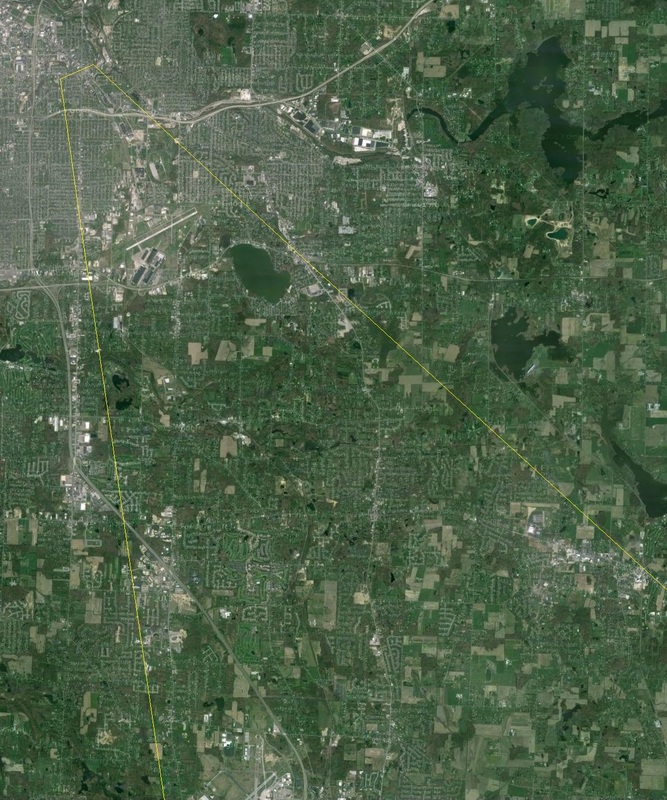 We know the aircraft altitude is 2,300 feet and the distance to the Green border is 6.955 miles. aircraft and then the height of the vertical black line at the Airdock. 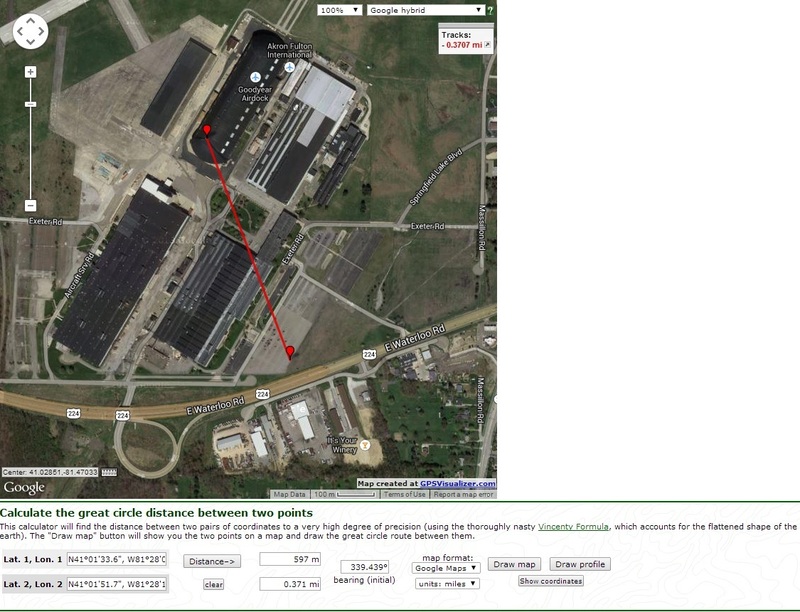 The distance from the Airdock to the Green border is 3.182 miles = 16,800.96 feet. The point that can be seen just over the top of the top Airdock is the Green border point. Therefore, we can conclude that indeed: "A portion of Green is somewhere in the distance". same position that the aircraft was when the old aerial photo was taken in 1937 or 1938. The top of the image is at the horizon. account for the different widths.